It’s taken commitment, guts and talent to create something out of nothing. And that’s something to celebrate! But the self-employment path is littered with challenges. Things like market conditions, competition, and supply and demand remain outside our control. 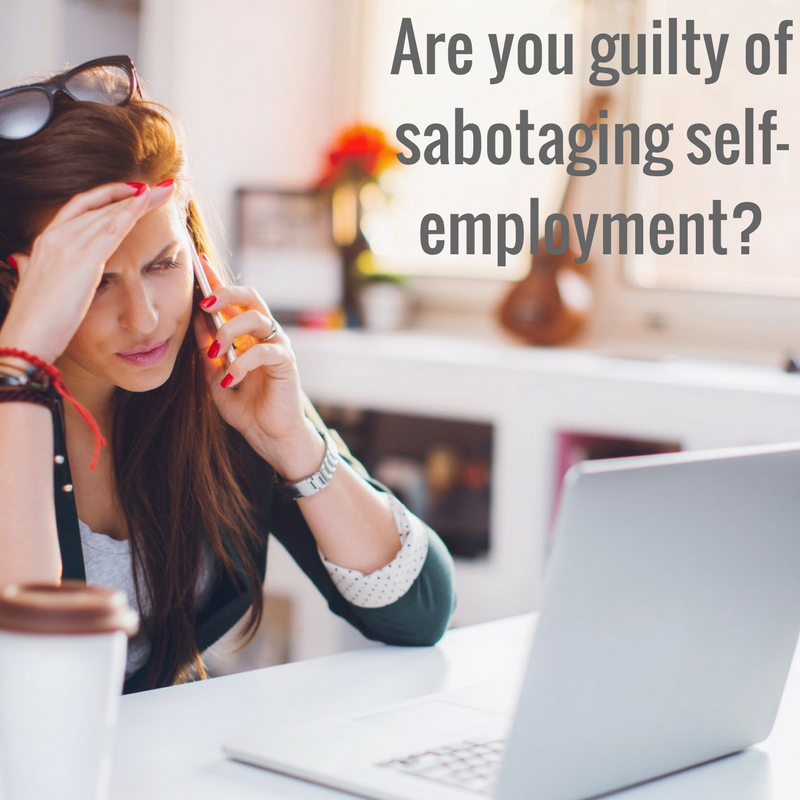 But often it’s the things we can actually control that we’re guilty of unintentionally sabotaging. Maybe it’s because you’re transitioning from an “employee” to business owner mindset. Or perhaps you’re still figuring out all the bits of the jigsaw needed to let your business survive and then thrive. Either way, allow me to share with you my personal experience and observations from supporting Hampshire’s small business community so you can be mindful of any curveballs down the line. I set up The Winchester Bookkeeping Company knowing there was much to do but under the naïve perception that I could do it all myself. I had no network of contacts to fall back on, no knowledge of selling or marketing, no experience in either the design or creation of a website and was little interested in social media. Little deterred me and I ploughed on regardless. Months down the road, there was little to show for my efforts. I was attracting the wrong type of enquiries into my business but didn’t want to turn work away. Can you relate? I was networking relentlessly, dabbling in social media and wasting a lot of time and effort in my generalist and “scatter gun” approach to marketing. I felt conscious that my website reflected an image of what I thought I ought and was expected to project … but not what I actually wanted to get across. So I made the decision to invest in support for my business. I attended Lisa’s workshop, followed this up with her mentoring support and she introduced me to Rosemarie Gant who became my WordPress angel. I now have a compelling website – a true reflection of who I am and who I can help. My services are packaged in a way that resonates with the clients I want to attract. The additional clarity I gained in defining my niche, learning how to market with authenticity and integrity has given me the confidence to offer support in ways that I hadn’t previously considered. The result? My investment paid off. I spent less time fielding queries from clients who were not “the perfect fit” and slowly gained the clients who were a natural fit. The dividends accruing from my initial outlay paid off within months. So what holds us back from investing in support? I fell for this one. Yes I did manage to build my own website and dabble in marketing but I didn’t have the expertise in these areas to achieve the results I had hoped for. Read any article by a successful entrepreneur and they will all cite that the key to success in business is to “surround yourself with good people”. Build a team of trusted advisers around you by using expertise from the talented self-employed community (owner managed businesses like yours) on an ongoing or one-off basis. Can you relate? You’ve started your business from scratch and naturally you don’t want to spend any more than the absolute minimum in getting it off the ground. Perhaps you’ve already invested in training, paid for a great logo or spent money on getting good quality business cards. For many small business owners this is the limit. This, as I learnt, is a false economy. Invest in getting the foundations to your business sorted at the start and you will save your sanity and your money in the long run. Often that initial outlay is easily recouped in the extra business coming through (through effective marketing), by saving money and tax (through accounting/financial support) or gaining clarity over your business objectives so you can drive your business forward (business coaching/mentoring). Plus, in most cases the support is deductible as an expense from your profit and you will pay less tax as a result. And don’t discount looking into external funding for your business. The government no longer offers growth vouchers but many local councils provide grants to support small business in the early stages. I’m saddened by the volume of small businesses I’ve seen that “coast” along for years – their owners oblivious to how and where they could be (more) successful and profitable. Investment needs to take place at every stage from start-up to growth. You could consider investing in financial support (using accounting software or outsourcing your bookkeeping) to save you money or free up valuable time, marketing support to drive your sales and growth or getting the help of a virtual assistant to ease administrative pressure. As a time-strapped business owner it’s tricky, but try and carve out (and protect) time in your diary to go to talks by other business owners. The Workstead just outside Winchester hosts a really impressive selection. We tend to make big decisions based on who we know, like and trust so go out there (or hop online); meet other fellow business owners, attend talks given by experts in a particular field, frequent networking events and ask for personal recommendations from others who have already made those valuable connections. You can also sign up to mailing lists (mine’s here) and get really relevant and valuable blog posts (like these ones) on a regular basis that way. At this level, there is no commitment to buy and you can unsubscribe at any time. Are you embarrassed to charge full price to friends or friends-of-friends? Do you waiver on price? Have you discounted products or services in an attempt to drum up sales? Do you feel awkward giving a price ‘in the moment’ and so find yourself caving in? Pricing your product or services (then holding firm) is so hard isn’t it? You aren’t alone. You want to be affordable and accessible. But sadly a desire to take any custom, coupled with a lack of confidence around pricing strategy and methodology can sabotage a business. Cave in on price and in the short term you’ll feel resentful, demoralised. Longer term, it’s unsustainable and your business will ultimately fold. If you are pricing a service, try and set prices that reflect the outcome you provide. Consider the time and cost you’ve invested in achieving your qualifications and expertise, the courses and literature you’ve read to stay informed. Don’t sell yourself cheap. Include ALL the costs of your business when setting prices. Include your overhead costs. At the end of the day you won’t make any profit unless all your costs are covered and you’d be amazed how many small business owners don’t have a grip on these amounts. Have a pricing strategy – price bands are fine but stick with your strategy. This will help you state your price with more authority and confidence. Don’t waiver on price or over-discount. Customers have a knack of picking up on lack of confidence and may assume your products and services aren’t worth the value you place on them. Don’t forget that there could be other reasons why people are not buying from you. Don’t assume the reason is pricing. There is no magic formula to help you perfectly price your product or service but do invest in the time (and/or support) to give it thorough thought. I cover pricing in more detail in my training packages for sole traders. Every business needs a system for managing the money coming in and the money going out. Knowing which records to keep and how to record your income and expenditure, invoicing your customers, performing bank reconciliations, regular updating of your records are all essential elements to maintaining an effective accounting system for your small business. It is important to know how much you are making (your profit), how much you have in the bank (your cash-flow) and keep track of your expenses so that you can see how your business is performing. A good system helps you (or your accountant) prepare an accurate tax return and pay the correct amount of tax. So that’s the theory but how many small business owners start out with the knowledge required to set up an effective bookkeeping system? Most small business owners are happy to do their own bookkeeping and this is completely acceptable – particularly in the early stages when the number of transactions is low. What is essential though is having the knowledge of what you should be doing right from the start. I see many sole traders further down the line who have set up systems without the necessary knowledge and they’ve ended up paying additional amounts to accountants at year end to sort out inadequate accounting records. Others miss out on claiming refunds and deductions for expenses that could have saved them hundreds of pounds. Taking the leap into self-employment means exiting your comfort zone. It means grappling with a whole new raft of skills and cultivating a different mindset. It means never quite getting to the bottom of your to-do list. No one ever said that going into business would be easy. But, by getting the foundations in place and focusing on building trusted relationships through investing in support, you will be giving your business the best possible chance of being sustainable and profitable in the long run. Tell me, what’s been your experience? Do leave a comment. I’d love to know. If you’ve enjoyed this post and found it helpful, feel free to share using the icons below. And don’t forget to join my mailing list to be the first to receive more tips just like this.